There is of course a very long tradition of text painting. It’s just that it’s not an art tradition but a commercial one: signwriting. Though shop signs are seldom painted now it’s still a form we recognise. This is an approach to painting that is about immediate communication of a message. 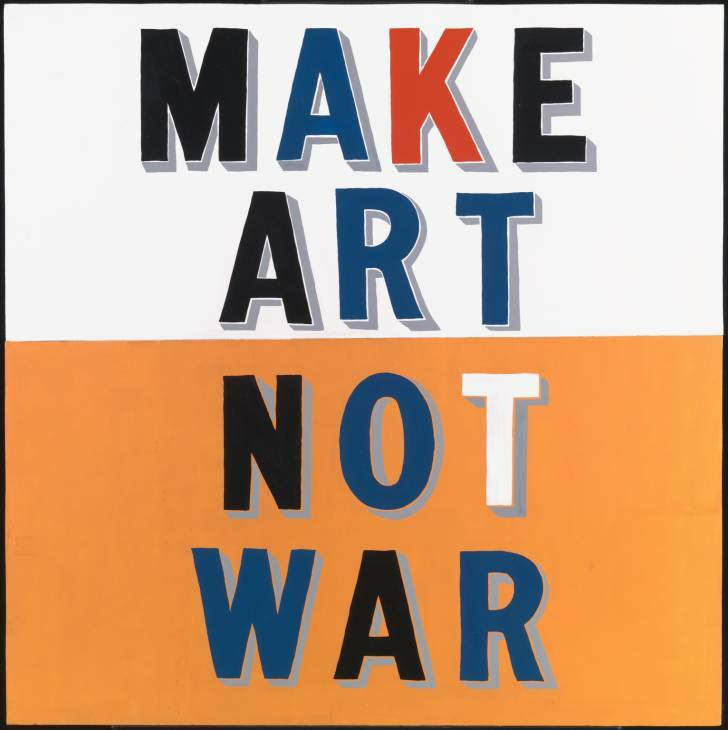 And it’s an approach Bob and Roberta Smith uses very effectively as art. Smith’s messages – or should I play along with the notion of Bob and Roberta as two people and makes that the Smiths’ messages? I’m not usually confused by apostrophes, but I’m making an exception here – are by turns funny, political, inane, art-related, tram-obsessed and often slightly bonkers in a very good way. Smith often continues to make work during an exhibition, so that the display evolves as the show continues. During the 2009 Tate Triennial, Altermodern, he made a new work each week following conversations with the exhibition’s curator Nicholas Bourriaud. Each week the new work would be placed somewhere within the space and the previous week’s work would be moved to an area set aside for Smith’s work. 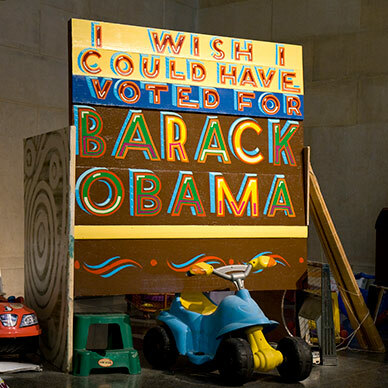 In Intelligence – the first Tate Triennial, in 2000 – Smith invited visitors to the exhibition to leave notes of protest in a box in the gallery and each week would select some to paint onto the gallery wall adding to the installation. 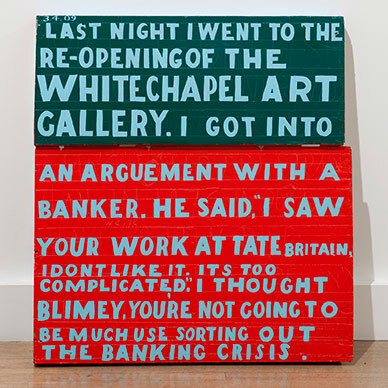 The strategy of adding work throughout the exhibition has worked well for Bob and Roberta Smith but it’s not without risks, particularly when taking the approach of the artist as a facilitator of the public’s views. Much of Smith’s recent work has been concerned with climate change. In some works this emerges as a fascination with trams, which he would like to see widely reinstated, but he also encourages engagement with environmental politics usually employing humour to get his point across. 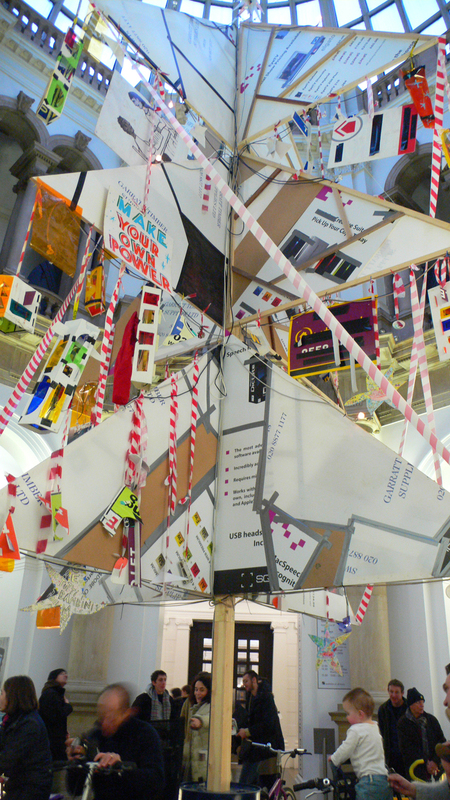 When asked to design the Christmas tree for Tate Britain, Smith recycled scrap materials he found around the Tate then added bicycles so that visitors had to power the tree lights themselves. This truly is art made of anything and everything and art that’s only complete with the cooperation of the audience. 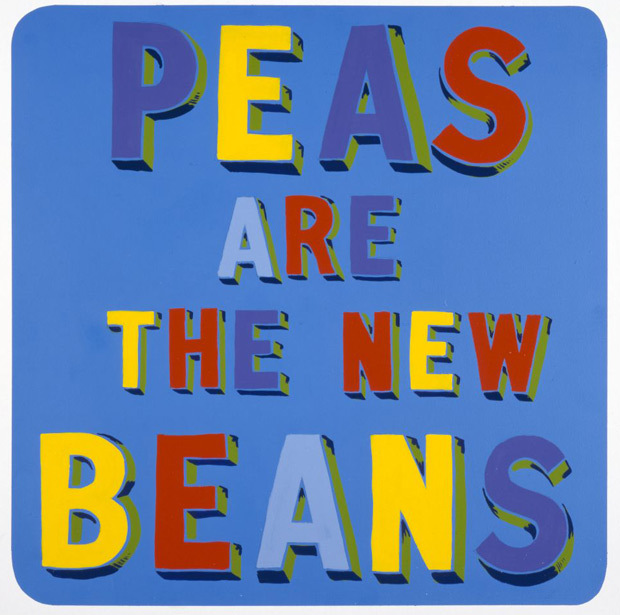 This entry was posted in Installation, Painting, Text and tagged Altermodern, art, Bob and Roberta Smith, Make Art Not War, Make your own Xmas, painting, Patrick Brill, Peas are the new beans, signs by Ann Jones. Bookmark the permalink.